In the early autumn sunshine, rowan trees can’t help but draw the eye. Clusters of berries flash brilliant red against the feathery green foliage, swaying heavily in the wind, enticing hungry birds of all shapes and sizes to plunder them. 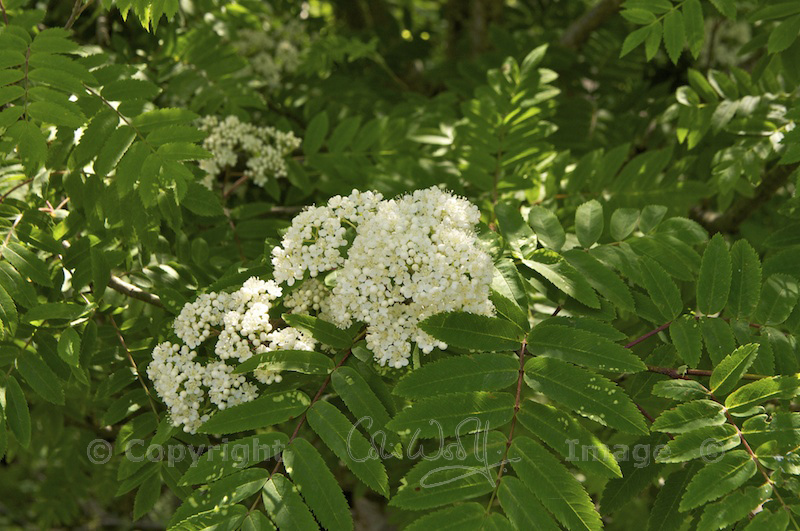 The mountain ash (Sorbus aucuparia) has many names: ‘rowan’ is perhaps the most familiar to us, but it is also known as the ‘quickbeam’, ‘sorb apple’, ‘wicken’, or ‘witchwood’. In Irish its name is ‘caorthann‘, and in Gaelic ‘caorunn‘ (pronounced ‘coroon’). A deciduous tree, it has lovely slender branches covered in silvery-grey bark, and distinctive leaves of between nine and 15 ‘leaflets’ arranged in opposing pairs. The leaves have serrated edges, distinguishing them from those of ash trees, which are smooth. Between May and June, a froth of creamy blossoms appear, sweet-scented to attract pollinating insects such as bees and beetles. Later, these flowers are replaced by scarlet berries, irresistible to birds such as siskins, blackbirds and chaffinches; even the portly black grouse are tempted up into the branches in search of food. In the late summer and autumn, it’s exciting to watch flocks of fieldfares and redwings descending noisily on a mountain ash tree, before moving on swiftly after they’ve eaten their fill. 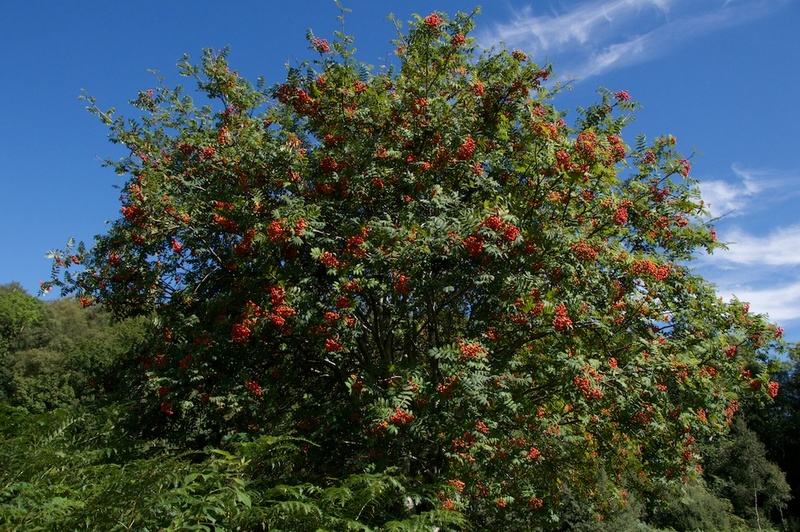 The mountain ash definitely relishes a challenge: it is fast-growing and relatively short-lived, meaning that its trunk rarely reaches any great girth. In Britain, it grows at higher altitudes than any other tree, clinging to life at heights of over 1,000 metres (3,200 feet) in the Scottish Highlands. These specimens are often gnarled and stunted, like a natural bonsai. 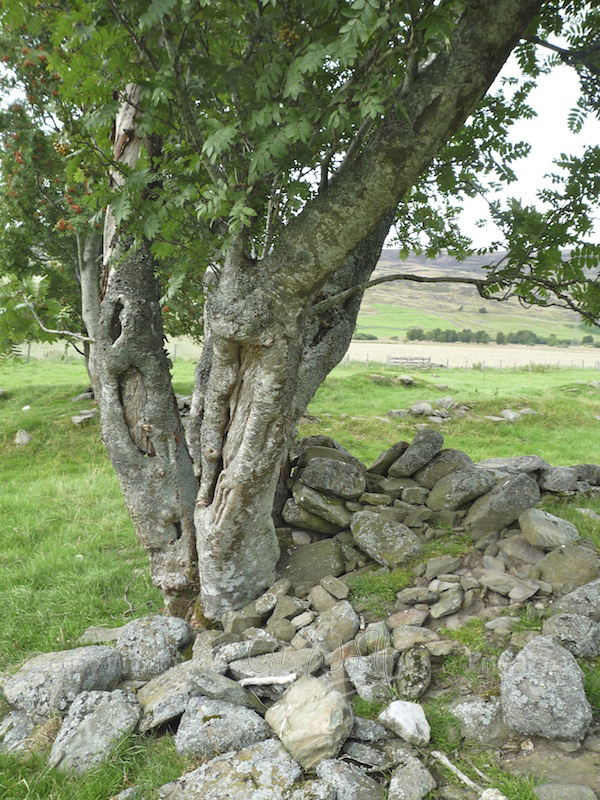 Preferring light acid soils, rowan trees are often seen braving the wind on a bare hillside, their roots having penetrated a crevice in a rock face. They can also spring up in the shade of a Scots pine, their seeds having been dispersed by the droppings of birds sitting in the branches above. An important species of the Caledonian Forest, the mountain ash doesn’t create its own woodlands but prefers to blend into forests of oak, birch and pine. 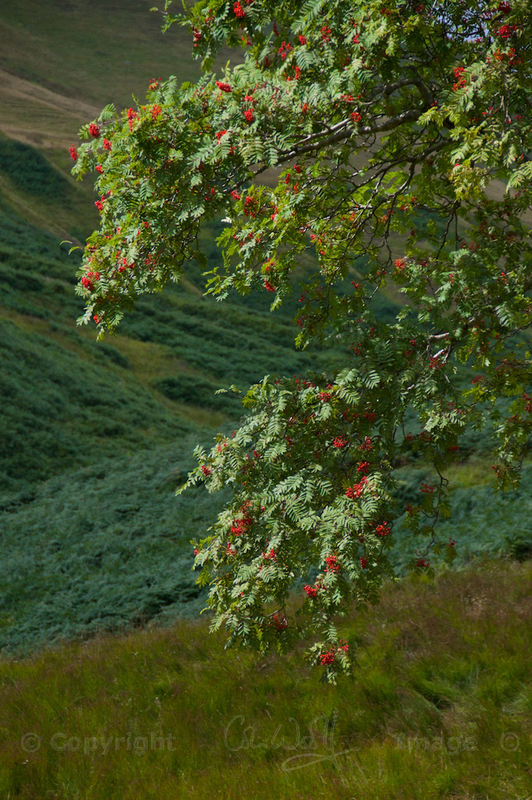 Rowan trees support an incredible amount of wildlife. Quite apart from the birds and insects that feed on it, the branches are home to a wealth of fungi and lichen; in fact, a newly-identified lichen that is endemic to Scotland grows mainly on rowan. Red deer love browsing on its bark and leaves, and mountain hares will also nibble the young saplings. As you’d expect, the wood of the mountain ash is tough and strong, and traditionally it has been used to make tools, bows, walking sticks, spinning wheels, cart wheels and beams. Druids carried staffs of rowan, and it has also been used as a dowsing rod. The berries and the bark provided a dye for wool, while for centuries cooks have used rowan berries in a variety of sweet and savoury recipes, among them delicious jellies to be eaten as a relish with meat. 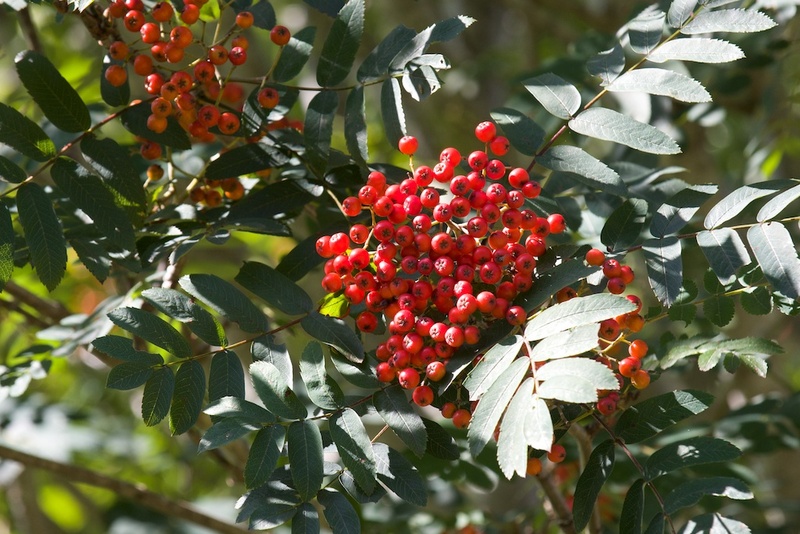 The rowan offered considerable health benefits, too: a distillation of its bark was prescribed to cleanse the blood and alleviate stomach upsets. The berries were eaten by sufferers of scurvy, as they contain high levels of Vitamin C.
No tree has more mystical associations than the rowan. Beloved by the druids, it is often found growing close to stone circles and ancient burial sites, where it is believed to protect the spirits of the dead. Because of its white flowers it was considered a ‘faerie tree’, enhancing psychic powers and the appearance of visions. In times gone by, sprigs of rowan were either worn or carried as a protection against evil; these amulets would also be placed in a cattle shed to protect the cows (and their milk) from enchantment. If a rowan tree took root next to a dwelling, it was considered great good fortune for all who lived there. In old Irish legends, symbolic events often take place under a Quickening Tree, or mountain ash. Housed in the Pitt Rivers Museum in Oxford are several loops and crosses of rowan, donated by the archaeologist Rev Canon John Christopher Atkinson in the late 19th century, and believed to have been made by an old man in Strathdon, Aberdeenshire. To ward off evil, these crosses were traditionally placed above all the openings of a house on Lammas Day (1st August), by a person who was forbidden from speaking to anyone whom he chanced to meet; there is another tale, which tells that they were placed there by a horseman who turned his horse three times before placing each loop. The Norse people held the rowan in similar esteem. Their god, Thor, had been saved from a fast-flowing river when he clung to the branches of a mountain ash. They believed that this was the tree from which woman was first made (the first man having been fashioned from an ash tree). Its wood was preferred for the carving of ancient runic symbols, and in fact the word ‘rune’ is believed to share the same root as ‘rowan’. Looking even further back in time, a Greek myth attempts to explain the berries’ bright colour. Hebe, the goddess of youth, was the keeper of a magic chalice containing ambrosia, the nectar of the gods. The chalice was stolen by demons, and the gods sent an eagle to retrieve it. (I am sure this looked good, but I have to say they really should have got it themselves: they were gods, after all.) As it battled with the demons, the eagle was wounded and a few drops of blood spilled from its wounds; these fell to the Earth and sprang up as rowan trees. The leaves of the trees were said to represent the eagle’s feathers. I don’t know about you, but next time I see a mountain ash I might stop for a few minutes to try and absorb some of its ancient magic! I really enjoyed this post! Growing up in the Highlands it was taken as common knowledge that the Rowan trees outside a house were there to ward of bad spirits. I meet a lot of folk from all around the world in my current work and I so enjoy getting to tell folk stories. Such an unassuming tree, yet beautiful in its simplicity and heritage. Interesting to read of other stories associated with it, too. One wee word though (because I’m a pedant): in Gaelic, it’s a hard C in caorann. The -ch sound (like in loch) is always written as such, otherwise all Cs are hard, like a K in English. Hi Anna, Thank you very much and I am really glad you enjoyed the post! 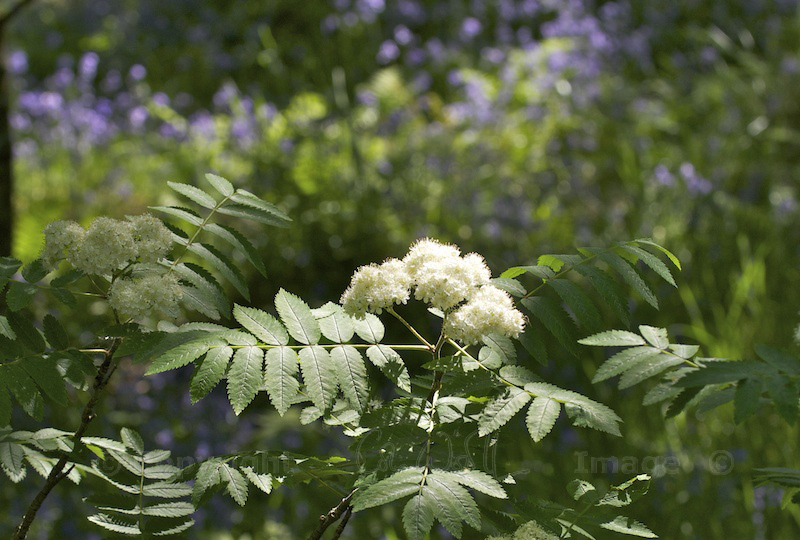 I love the rowan too, and it’s nice to meet someone else who shares that feeling. It sounds as if you grew up in a beautiful place, and it’s good to know that some of the folklore survives. Thanks for your correction about the Gaelic – I will check my source again! I would love to learn Gaelic – it always sounds such a lovely language but there is not much call for it where I live (West Lothian). When we lived in Wales I learned Welsh, which I really enjoyed, and I can see many similarities in Gaelic place names. I will pop along to your blog now and have a look! Meanwhile thanks again. You’re right, I am very interested to know that! What a lovely connection – I am going to have to read about that. I’m glad you’re enjoying looking around The Hazel Tree. There are so many places I want to visit, too! I have six large Rowan trees in my garden (plus many other trees) but now I know the reason why…..to ward of evil…..and I thought they were just to feed the birds that strip them in about 10 minutes per tree. Flocks of gold finches descend in a torrid fever, its amazing to watch and they don’t miss a berry 🙂 Lovely to learn about them, thank you. You have some very hungry birds in your garden! The goldfinches must be an incredible sight when they come down in such numbers. When we lived in Wales we used to watch flocks of fieldfares and redwings travelling from one tree to the next, on the opposite hillside from our house. Then, almost by magic, the berries practically disappeared. 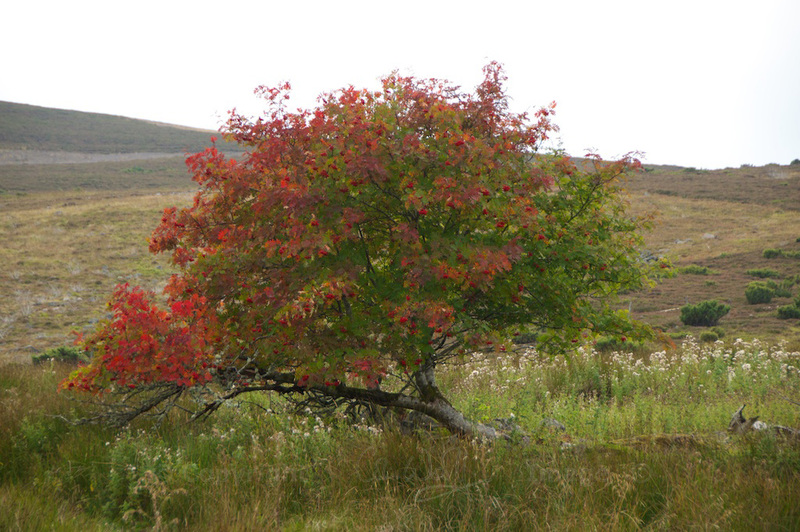 Really glad you enjoyed reading about rowan trees – thank you! Those red berries are such a cheering sight, especially on a sunny day against a blue sky. Lots of fascinating information here and I was particularly interested in the connection with runes and the story about the eagle. 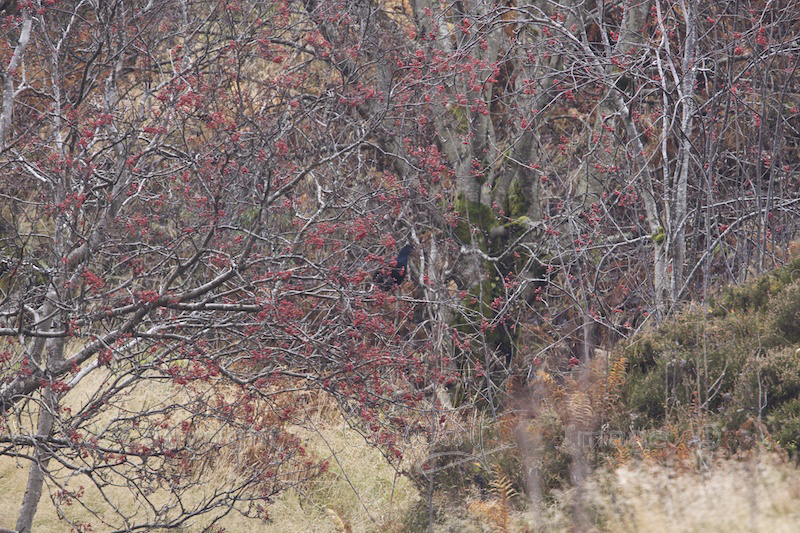 It astonishes me that black grouse can get themselves up into the branches. Beautiful photographs. The other day we took a stroll around town and stopped to admire a beautiful tree bearing such bright and large clusters of berries. From afar they looked like flowers. We took pictures and i decided to look up for identification. I could barely believe that I was seeing this tree in your post, and this in Scotland!. Now I know it is the Rowan. Our Main St is aligned with several of these specimens, who thrive in this fierce New England weather. The information about the Rowan is fascinating. From the roots of its name, to folklore and history. Thank you for this great post and pictures. What a coincidence! I have heard how beautiful New England is in the autumn. It sounds as if your climate is a bit like ours, and the rowan trees are very much at home! Thanks for your lovely comment – glad you enjoyed the post. Autumn here is spectacular, with the foliage season just starting. As we live in northern New England, we get it first :-). Just a note on our local Rowan trees: they survived the devastating hurricanes that have been pounding this area every year. Perhaps because they are not too tall, perhaps because of their hidden magic!. Thank you for a most enjoyable read. You are too kind – thank you very much! I love finding out about our native trees, and I’m really glad you enjoyed it. Thank you for the link and generous words on your blog. I’m really looking forward to seeing autumn in your neck of the woods, too! Hi Jo, I really enjoyed this post…in fact anything regarding trees will capture my attention! The last photo looks like a scene in Maine where Mountain Ash is common. This was a great read! Thank you very much, David! I love that last photo, too – it’s Crinan harbour, where we went recently. The mountain ashes everywhere are brilliant at the moment – lovely to see. I am happy you’ve found my site, in that case! How fascinating, to have collected stories about the rowan for so long – you must have a treasury of them! Have you published a book, or do you have a website? (The web address in your comment email didn’t translate properly for some reason). Thank you for sharing the stories behind these great tree species — it is a blessing! Most welcome, Heather, and thank you for your kind comment! I love finding out about trees and their lore.